Aim: The aim of this in vitro study was to compare the shear bond strengths of two different dentin bonding agents with two different desensitizers. Materials and Methods: Eighty molars were taken which were ground to expose the dentin. The teeth were divided into two major groups. Each major group was subdivided into four subgroups of 10 samples each. Groups Ia and IIa were treated as dry bonding groups, groups Ib and IIb were treated as a moist bonding groups, groups Ic and IIc were rewetted with Gluma desensitizer, and groups Id and IId were rewetted with vivasens desensitizer. Major group I was treated with Gluma comfort bond and Charisma. 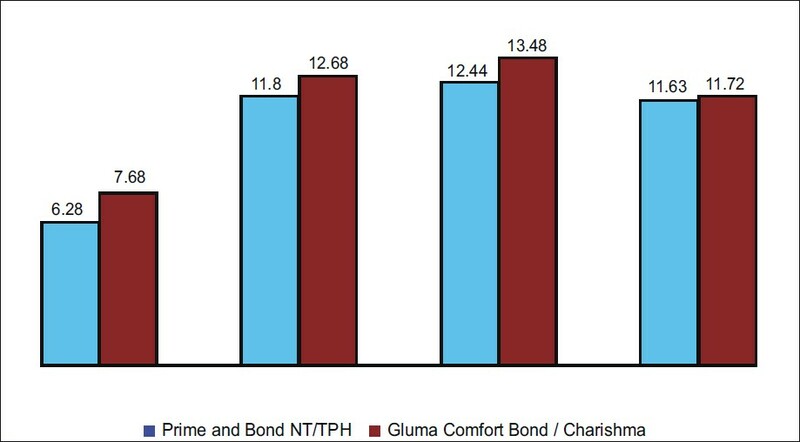 Major group II was treated Prime and Bond NT and TPH. The samples were thermo cycled and shear bond test was performed using an Instron machine. The data were analyzed using one-way analysis of variance and Tukey's Honestly significant different test. Results: The results revealed that the specimens rewetted with Gluma desensitizer showed the highest shear bond strength compared to all other groups, irrespective of the bonding agent or composite resin used. Conclusions: It can be concluded that rewetting with desensitizer provided better bond strength than the other groups. Composite resins are being used with a greater frequency today as an esthetic alternative to dental amalgam. Strong durable bonds between dental biomaterials and tooth structures are essential to achieve mechanical as well as biologic and esthetic properties. This has lead to various developments in the field of adhesive restorative dentistry. Bonding of resin to enamel is due to the micromechanical bond between the resin bonding agent and the highly inorganic substrate of enamel, which is achieved by the acid etching procedure. However, bonding of composite resin to dentin is comparatively difficult due to the complex structure of dentin with a low inorganic content randomly arranged in an organic collagen matrix and the presence of dentinal fluid. Acid etching removes the supporting inorganic matrix of dentin, leaving the organic substance, but the collagen in the organic substance shrinks and collapses easily when it is dried with air syringe after being rinsed with water. The moist or wet bonding technique is one way to preserve the micro morphological integrity of the collagen, and studies have reported that optimum infiltration of adhesive resin into the demineralized layer  occurs, giving higher bond strength values. Over wetting and over drying conditions may have undesirable effects on the bonding performance. To achieve a balance between the two conditioned dentine, various desensitizing solutions have been suggested as rewetting agents. ,, Desensitizing agents reduce the postoperative sensitivity and also enhance the bond strength associated with composite restoration. This in vitro study was designed to evaluate the effect of rewetting dentin with two desensitizers on the dentin shear bond strength and to compare them with moist dentin, dry dentin and dentine with different rewetting agents. The null hypothesis for this study was that there would be no significant difference in dentin shear bond strengths under these three conditions. These are given are listed in [Table 1]. Eighty freshly extracted, caries-free human permanent molars stored in 10% buffered formalin solution for 2-4 weeks were debrided using periodontal curettes. After cleaning, the teeth were stored in distilled water until use. These specimens were divided into two major groups. Each group was further divided into four subgroups containing 10 teeth each [Figure 1]. In the dry group, the etched dentin surface was gently dried with oil-free air for 10 sec until a frosty white appearance of the etched enamel was observed. In the moist group, the etched dentin surface was gently dried with an absorbent paper to produce a visibly moist and not desiccated surface. In rewetting groups, the rewetting agents (Gluma desensitizer and vivasens desensitizer according to the respective grouping) were applied with the applicator tips over the dry dentin surface according to manufacturer's instructions. Followed by the application of the respective bonding agents, the different dentin surfaces were light cured. Resin composite cylinder was placed over the adhesive with the help of metallic disk (2 mm height and 4 mm diameter). The composite was polymerized for 40 sec using light curing unit Eli par highlight. Then the disk was removed. The specimens were stored in distilled water at 37°C for 24 hours. Thermocycling unit was custom fabricated. It consisted of thermocouple and a heating element. A temperature sensor kept in the water bath was connected to a digital display unit. Temperature of 8-48°C was set with this unit. The specimens were thermocycled in a water bath set between 8 and 48°C for 2500 cycles with a 30-sec dwell time and 10-sec transfer time. Then, the specimens were stored for 1 week in distilled water. The results of testing were entered into an excel spreadsheet (MicroSoft) for calculation of descriptive statistics. One-way analysis of variance (ANOVA) was used to compare the shear bond strengths of the different dentin treatment surfaces. Tukey's Honestly significant different (HSD) test was used to identify the significant pairs at 5% level (SPSS/PC Version 10.0 SPSS). For both the bonding agents, dry dentin resulted in low bond strength compared with other groups. Although rewetting with Gluma desensitizer shows greater bond strength when compared to vivasens, both of them did not significantly differ from moist dentin [Table 2] [Figure 2]. Composite restorations are extensively used in the field of restorative dentistry; the mechanical durability of the material still remains an area of concern. Enhancement of bond strength without compromising the biologic and structural integrity of the tooth can provide a solution to the problem. Achieving predictable bonding to dentin has long been a goal and challenge in restorative dentistry. Dentin bonding agents contain hydrophilic monomers as primers along with a solvent such as acetone or ethanol and an adhesive resin. However, the total-etch technique is highly technique sensitive. When etched dentin is dried using air syringe, the collagen fibers collapse and result in molecular arrangement changes. Excessive drying with air blast to the dentin surface, followed by acid conditioning results in desiccation of the dentin, causing a collapse of the dentin demineralized zone, making it difficult for the hydrophilic resin primer to penetrate completely to the depth of the etched zone. Therefore, bonding to dry dentin results in an incomplete formation of the hybrid layer by compromising the resin infiltration and impregnation of this acid conditioned layer. In this study, bonding to dry dentin gives the lowest shear bond strength compared to other groups (group Ia and group IIa). This result is in agreement with the results of many other studies ,, which showed a significant reduction in bond strength. Most studies have reported that with a moist surface, higher bond strength values are achieved. The risk of moist dentin is an over wet condition resulting in excessive water, which appears to cause phase separation of the hydrophobic and hydrophilic monomer components,  which leads to blister and globule formation spaces at the resin-dentin interface. Therefore, it appears that a difficulty exists in achieving a balance between two extreme conditions, which may have undesirable effects clinically on the bonding performance. Here, the dentin surface is left visibly moist (glistening) after etching and rinsing prior to application of the dentin bonding agent. It has been suggested that the inclusion of water in the adhesive may re-expand the collapsed fibrils and facilitate the infiltrations of etched dentin by the resin monomers. To overcome this problem, various rewetting agents have been tried. ,,, Rewetting following acid conditioning not only expands the dematerialized collagen network, but also favors the diffusion of the hydrophilic resin monomers into the etched zone. Some of the rewetting agents are used to expand the dematerialized collagen network; they are water, Gluma desensitizers, aqua-prep, 5% glutaraldehyde in water, Tubilicid, MS coat, vivasens,  Hurriseal, and Protect. The application of Gluma desensitizer after etching of dentin has been shown to improve the efficacy of dentin bonding system (group IIIa and group IIIb). Similar results have been reported in a few other studies. ,,, Improved bond strength may be due to the use of glutaraldehyde and 2-hydroxyl ethyl methyacrylate (HEMA). Glutaraldehyde is a known fixative and flocculating agent that crosslinks collagenous biomaterials. The aldehyde group of glutaraldehyde cross-linking primarily with the e-amino groups of lysine and hydroxylysine residues in dentin collagen resulting in protein fixation demonstrates that glutaraldehyde may bond to dentin collagen fibrils. This process could possibly stabilize the collagen layer and thus contribute to improved bond strengths. Vivasens was the other desensitizer used as a rewetting agent. It gave slightly lower shear bond strength value than the moist group (group Id and group IId). Similar results were shown by a study done by Lehmann and Degrange. The minimal effect of vivasens on the dentin bonding system remains unclear. One possible reason for the decreased bond strength may be the desensitizer blocking the dentin tubule orifices and intertubular diffusion channel, as it contain fluorides. Small volumes of methacrylates present in vivasens could be the cause for the higher shear bond strength associated with this material. From the results it can be concluded that within the parameters of this study, the null hypothesis stands negated as there is statistically significant difference in dentin shear bond strength between dry dentin, moist dentin and rewetting with dentin desensitizer in both the groups tested. Rewetting with a desensitizer increases the bond strength, but further studies are required to confirm this and also to determine their role in reducing the microleakage and associated postoperative sensitivity. 1. Nakabayashi N, Pashley DH. Hybridization of dental Tissues. Che.3, 1, 2. Tokyo: Quintessence publishing co Ltd; 1998. 2. Kanca J 3 rd . Resin bonding to wet substrate. 1. Bonding to dentin. Quintessence Int 1992;23:39-41. 3. Al Qahtani MQ, Platt JA, Moore BK, Cochran MA. The effect on shear bond strength of rewetting dry dentin with two desensitizers. Oper Dent 2003;28:287-96. 4. Pilo R, Cardash HS, Oz-Ari B, Ben-Amar A. Effect of preliminary treatment of the dentin surface on the shear bond strength of resin composite to dentin. Oper Dent 2001;26:569-75. 5. Perdigão J, Van Meerbeek B, Lopes MM, Ambrose WW. The effect of a re-wetting agent on dentin bonding. Dent Mater 1999;15:282-95. 6. Perdigão J, Swift EJ Jr, Heymann HO, Malek MA. Effect of a re-wetting agent on the performance of acetone-based dentin adhesives Am J Dent 1998;11:207-13. 7. Ritter AV, Heyamann HO, Swift EJ Jr, Perdiago J, Rosa BT. Effects of different re-wetting techniques on dentin shear bond strengths. J Esthet Dent 2000;12:85-96. 8. Oilo G. Bond strength testing-What does it mean? Int Dental J 1993;43:492-8. 9. Triolo PT Jr, Swift EJ Jr, Barkmeir WW. Shear Bond strengths of composite to dentin using six dental adhesives systems. Oper Dent 1995;20:46-50. 10. Haller B. Recent developments in dentin bonding. Am J Dent 2000;13:44-50. 11. Gallo JR 3 rd , Henderson M, Burgess JO. Shear bond strength to moist and dry dentin of four dentin bonding systems. Am J Dent 2000;13:267-70. 13. Tay FR, Gwinnett AJ, Pang KM, Wei SH. Variability in Micro leakage observed in a total etches wet-bonding technique under Different Handling Conditions. J Dent Res 1995;74:1168-78. 14. Van Meerbeek B, Yoshida Y, Lambrechts P, Vanherle G, Duke ES, Eick JD, et al. A TEM study of Two water based adhesive systems bonded to Dry and Wet Dentin. J Dent Res 1998;77:50-9. 15. Lopes GC. Shear bond strength of acetone based one bottle adhesive system. Braz Dent J 2006;17(1):39-43. 16. Lehmann N, Degrange M. Effect of four desensitizers on the shearbond strength of three bonding systems. European Cells and Materials 2005;9.Suppl(1):52-3. 17. Soares CJ, Santos Filho PC, Barreto BC, Mota AS. Effect of previous desensitizer and rewetting agent application on shear bond strength of bonding systems to dentin. Cienc odontol bras 2006;9(4):6-11. 18. Ritter AV, Bertoli C, Swift EF Jr. Shear Bond Strengths of Gluma Bonding Systems to Dentin. J Dent Res 2000;79:1852. 19. Ritter AV, Heymann HO, Swift EJ Jr, Perdigão J, Rosa BT. Effects of different re-wetting techniques on dentin shear bond strengths. J Esthet Restor Dent 2000;12:85-96. 20. Bansal A, Shivanna V. Effect of Rewetting agents on the shear bond strength of different bonding agents when applied on dry dentin. J Conserv Dent 2007;10:26-32. 21. Dijkman GE, Jongebloed WL, de Vries J, Ogaard B, Arends J. Closing of dentinal tubules by glutaraldehyde treatment, a scanning electron microscopy study. Scand J Dent Res 1994;102:144-50.